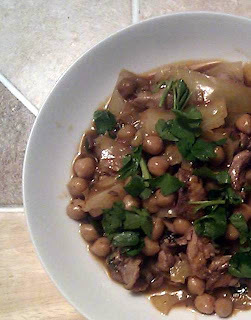 I really love chickpeas so when I saw this recipe that incorporated chicken thighs (another favorite), I was ready to give it a try. All of the ingredients were in my cupboards, except for the roasted red peppers that the original recipe called for. So I eliminated the red peppers and threw in some cabbage and carrots I had, and it worked out wonderfully. Of course, I also found out that A isn't that fond of whole chickpeas (something I never realized before, especially given his ability to eat entire containers of hummus in one go). Oops. Heat a medium pot or Dutch oven on medium-high heat. Season chicken aggressively with salt and then brown the chicken, skin side down, until it’s a deep, dark brown. (The best way to do this is not to move it for the first 4 to 5 minutes; then flip it over). Remove the chicken to a plate and turn the heat off for a few minutes before adding the garlic (otherwise it’ll burn). Also, if there’s a lot of rendered chicken fat in the pan, you may want to pour some of it out leaving a few tablespoons. Turn the heat back to medium-low, add the garlic and monitor carefully. When it’s fragrant but not at all brown add the cumin, tomato paste, and red pepper flakes; stir until a smooth paste forms, about 1 minute. Add the red wine, if you’re using it, scrape up the brown bits as it comes to a boil; then add 3 1/2 cups water along with a pinch of salt. (If you’re not using wine, just add 4 cups water.) Add the bay leaves and return the chicken to the pot; bring liquid to a simmer, put the heat on low and cook, uncovered, for 20 minutes or until the chicken is tender. Transfer the chicken to a plate. Add the chickpeas, cabbage and carrots to the pot; bring to a simmer and cook for 20 minutes. Meanwhile, shred the chicken and add to the stew whenever it is all shredded. Taste for salt. Sprinkle in cornstarch, if using, in order to thicken the stew a bit. Take the stew off the heat, add a splash of lemon juice (to taste) and a generous sprinkling of parsley. Serve with good bread.